Today’s fast-paced business world requires the continuous, integrated flow of information and new levels of productivity. Designed with this in mind, the imageRUNNER ADVANCE devices work seamlessly with Canon’s portfolio of solutions and services to streamline workflow and empower users. Now the imageRUNNER ADVANCE C3300 Series offers small workgroups access to powerful information management solutions. Impressively compact and cost-effective, these multifunction colour devices can change the way you work. These models can seamlessly integrate into your imageRUNNER ADVANCE network of devices. Consistent design and operation help users quickly master the Series. Effortlessly install, replace, and migrate settings for devices across your network. Use Canon’s advanced management tools to help you control costs by tracking usage and influencing user behavior. And, take advantage of Canon’s extensive portfolio of solutions and services to support your unique workflow needs. To help your bottom line, the imageRUNNER ADVANCE C3300 Series helps minimize costs and maximize reliability. The efficient product design, along with Canon’s high-yield consumables, help achieve a low cost per page and a low total cost of ownership. And with outstanding uptime and easy maintenance, you can enjoy consistent productivity. 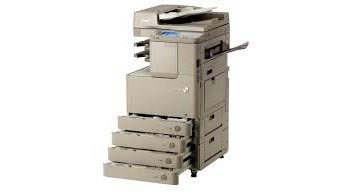 Compact yet powerful, the imageRUNNER ADVANCE C3330i/ C3325i models are an excellent fit in smaller environments. Easily handle a range of printing tasks from envelopes to sheets up to 12” x 18”. The inner finisher option can bind documents with either a staple or an environmentally conscious, staple-free closure.